Preheat oven to 160°C (325°F). Grease a 2.75-litre-capacity bundt tin. Place the prunes, bicarbonate of soda and water in a medium bowl, mix to combine and allow to stand for 10−15 minutes. Using a hand-held stick blender, blend the mixture into a puree and set aside. Place the currants and rum in a small saucepan over high heat. Cook, stirring, for 5–6 minutes or until plump. Set aside. Place the butter, vanilla, sugar and orange rind in the bowl of an electric mixer and beat for 10−12 minutes or until combined. Scrape down the sides of the bowl. Add the eggs, 1 at a time, beating well after each addition. Add the flour, cocoa, cinnamon, allspice, chocolate and the fruit mixtures. Beat to combine. Pour the mixture into the tin and bake for 1 hour or until cooked when tested with a skewer. Invert the cake onto a wire rack and allow to cool in the tin for 10–15 minutes. Remove the tin and allow to cool completely. 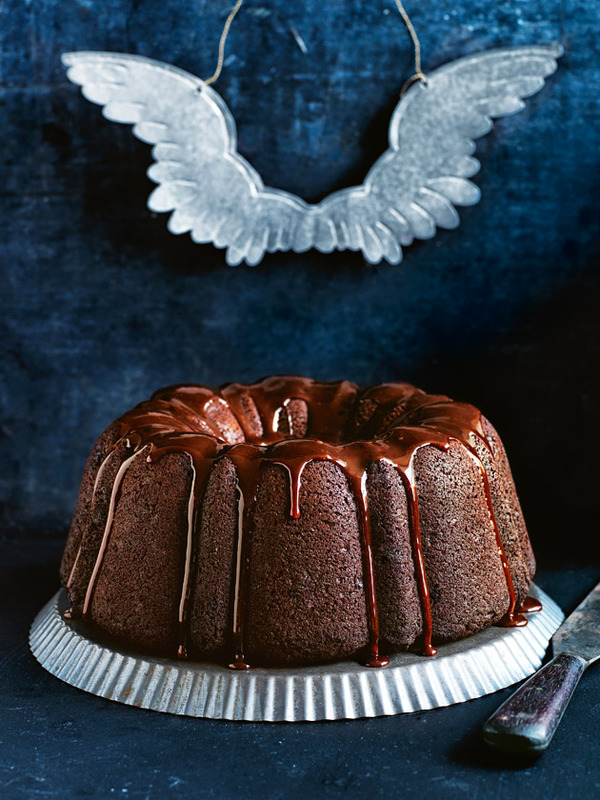 To make the chocolate quince glaze, place the quince jelly in a small saucepan over medium heat and whisk until melting. Add the chocolate and whisk to combine. Bring to the boil and cook, whisking, for 2–3 minutes or until thickened. Allow to cool at room temperature.